World Hypnosis Day was established to dispel myths and misconceptions of hypnosis which is due to Hollywood, media and popular literature. Hypnotism is not about ‘mind control’, and there is no way to make somebody do something against their will. These are just a few of misconceptions that World Hypnotism Day seeks to change and to educate the public to the benefits of the natural process of hypnotism has to offer anyone. Hypnotist professionals celebrate WHD in over 50 countries all around the world with many FREE or low cost events, talks, seminars, workshops and demonstrations. According to Luke Michael Howard Ph.D a renowned hypnotist, the date of WHD is perfect as many of us start the new year with many positive resolutions such as stopping smoking, losing weight or learning a new skill. Despite our New Year's resolution, most of us will broke them by the third week of January as new studies show. Hypnotist become an effective tool for the process and the desire of personal change. Hypnotism can help with weight loss, quitting smoking and many others areas such as anxiety , fears and phobia. A lot of studies show that people have more success and positive habits towards their goals when they experience hypnosis then the one that have not to. To carry on the tradition of World Hypnotism Day, Luke Michael Howard Ph.D has worked toward the recognition of the WHD. 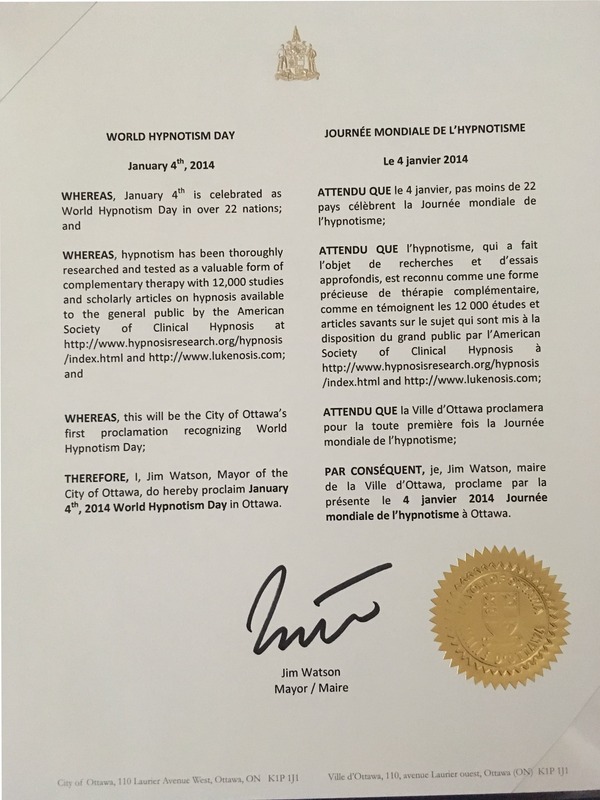 On January 4th 2014, Ottawa Mayor Jim Watson made a official proclamation to Ontario clinical Hypnotist Luke Michael Howard Ph.D and proclaimed it World Hypnotism Day official in Ottawa, Ontario, Canada. 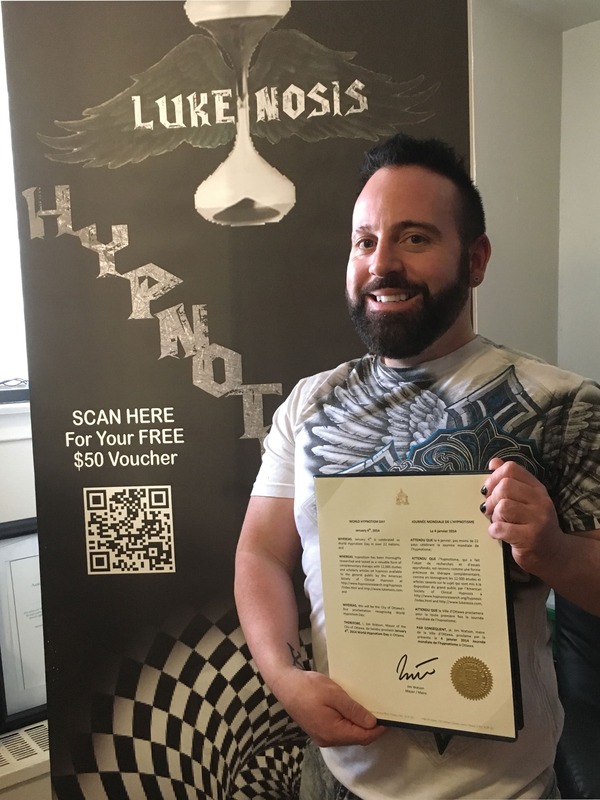 Luke Michael Howard Ph.D goal is to continue his effort toward the recognition of WHD and to have it proclaimed World Hypnosis Day in Toronto, On, Canada by Mayor John Tory in 2018. Luke Michael Howard Ph.D is a renowned hypnotist, has demonstrated that hypnosis is one of the most effective strategies for overcoming all forms of fear. Hypnotist Howard is an advocate of the power of hypnosis in treating a number of conditions, including fears, phobias, addictions & mental traumas. Luke Michael Howard, Ph.D, a Clinical Hypnotherapist, has specialized in hypnotherapy for almost 20 years, and is dedicated to helping local Ontarians overcome their problems in order to enjoy a better quality of life without fear.